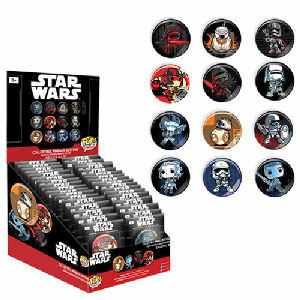 Be sure to get your Star Wars The Force Awakens Pop! Button Master Case hot of the truck! Fill in the Notify me when Available and you will be the first on your block to have a Star Wars The Force Awakens Pop! Button Master Case !! From the Star Wars Pop! Vinyl collection by Funko. Star Wars The Force Awakens Pop! Button Master Case. Master Case includes 32 display cases - each containing 34 buttons. A total of 1088 blind bagged pieces. Ages 13 and up. Item selection is random. Items are in blind packaging. We cannot accept requests for specific items nor can we accept returns on opened items. You may receive duplicates.